Ace2Three Rummy, the big name in online rummy industry has announced the first season of VIP rummy tournaments. 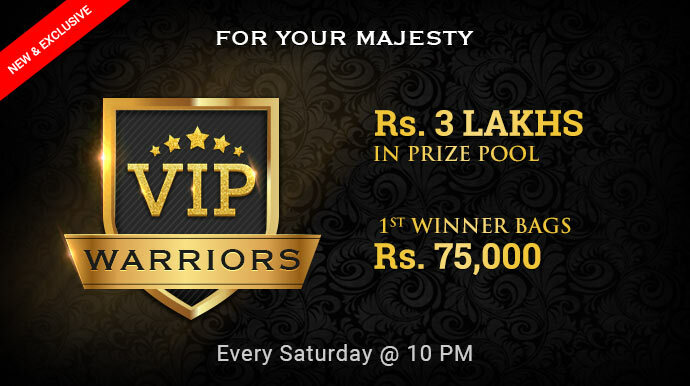 The tournaments named VIP Warriors is for the top players and can reward them with cash prizes worth Rs.3 lakhs. The tourneys will run on every Saturday. VIP Warriors rummy tournaments are for those players who have made real chip purchases at the website and have played at least a cash rummy game. You will still get the VIP invite from Ace2Three Rummy by luck only. If you have been lucky and a VIP member, join now to win big cash prizes! The VIP Warrior rummy tournaments from Ace2Three Rummy will run every Saturday at 2017. The tournaments will be in Stake Format with a maximum of 750 players. There will be 30 winners each tournament sharing a big prize pool of Rs.3 lakhs. The entry is free and is open now! You can register your seat for the rummy tournaments both through desktop and mobile client. Practice your game by playing at this ace online games 24×7 indian rummy website and strategize your game plan for the big Saturday event. Subscribe to our blog to get the latest updates on Indian rummy, promotions, tournaments, bonus offers and cashback deals. Want to read more about Ace2Three Rummy? Visit our review here. Got a feedback? Write your comments below!